I can't hike for ten to twelve hours a day, spend three hours in the evening debriefing, photo processing, and blog writing, get some decent sleep and eat a decent meal, and still have time to shop and restock the 'pantry'. Can't do it. The day only has 24 hours. Everything was low on supply. I was almost out of gas. I had run out of many of the food items I eat regularly. My cooler was not cool - just a mass of sloshing warm water. And even my body weight was below the critical 150 pound level. So today I took advantage of a rainy morning and reloaded. Last night I had taken care of the body weight issue, with a two hour AYCE feed at Golden Corral. This morning I bought out Wal-Mart, spending $175 on just the basics. 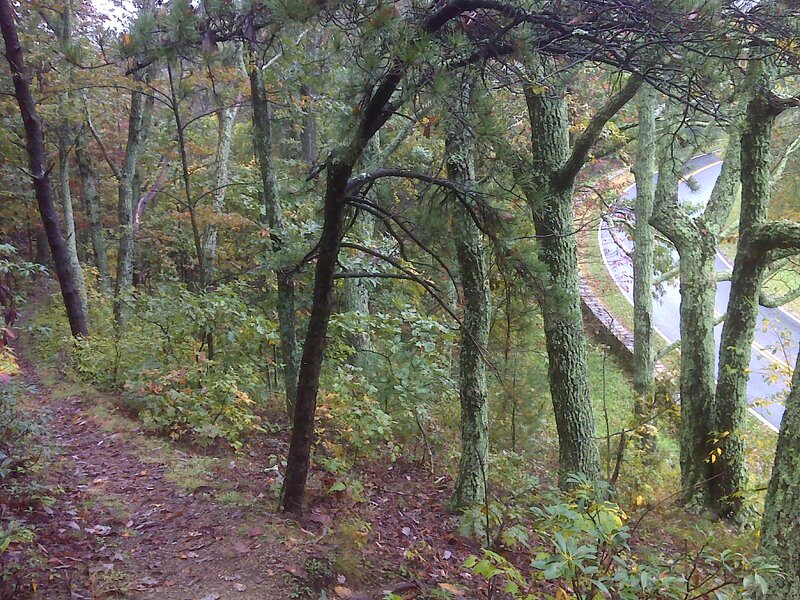 I filled the tank up with gas and finally headed out at noon as the weather began to let up. 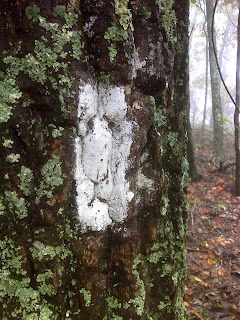 It was still drizzling and foggy with occasional rain when I hit the trail at noon. I hiked in my crocs and wore my poncho, either draped over me or tied behind my back like some sort of exotic ponytail when it wasn't raining. To entertain myself I spent 30 seconds 'enhancing' a white blaze that reminded me of the forlorn feline face of the Cowardly Lion from the Wizard of Oz. 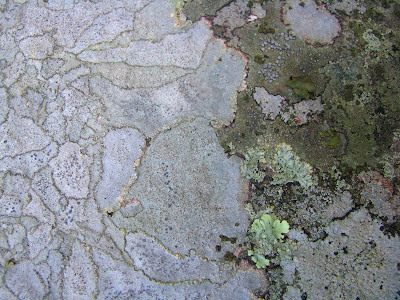 And again here, the lichens are full of life and color. And finally I spent a long time studying a few square inches of rock. There's an amazing dynamic story here (and on every square inch of exposed space in the woods) of the battle for space and light. Such stories, viewed as if frozen in time by us hurrying humans, absolutely fascinate me. 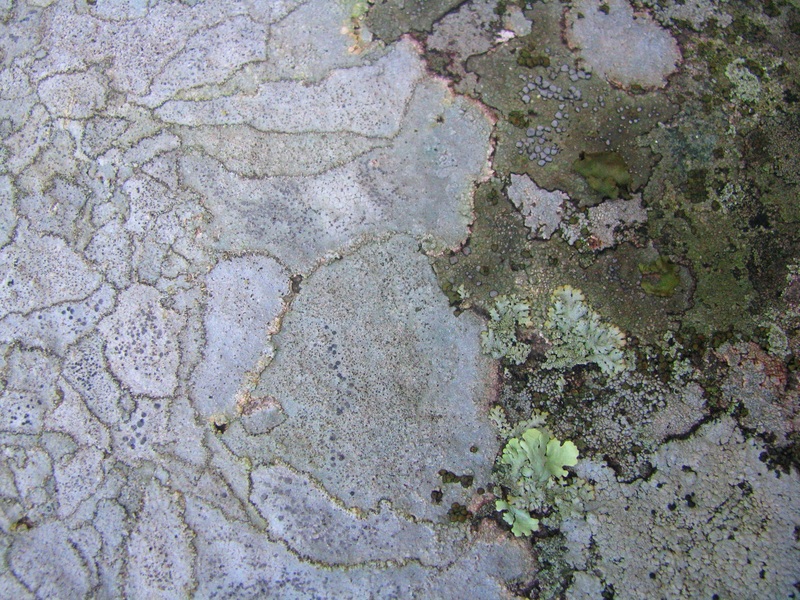 Here different clones of the same variety of lichen protect their boundaries, setting up a little battle-front between each individual clone. On the right other varieties are trying to encroach on this whiter variety, and are competing with one another for dominance. Some win, some lose and die out. The winners pass on their winning traits to their offspring, and the drama is repeated -- as it has done for hundreds of millions of years. Put in this perspective, my puny little quest to just blindly trample past a few thousand miles of these endless dramas, seems insignificant. So today, the human hiker named 'Seeks It' reconnected with "It" (the wilderness) in profound ways; and I felt as though I had a particularly good day as a result.